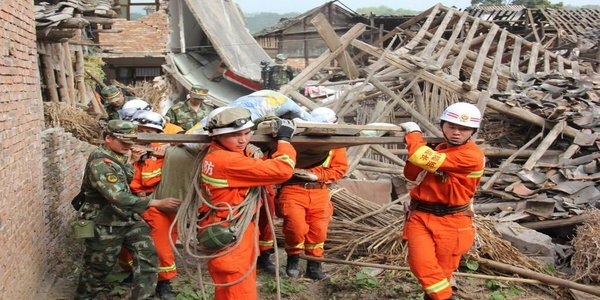 The death toll in southern China’s earthquake rose to 589 on Wednesday as search and rescue teams pushed into isolated mountain communities to clear debris from collapsed homes. The Yunnan provincial government said more than 2,400 people were injured in Sunday’s 6.1 magnitude quake in the mountainous Yunnan farming region of Ludian county — the country’s deadliest temblor in four years. At a makeshift headquarters in the forecourt of a cracked middle school in the worst-hit town of Longtoushan, a senior colonel in the People’s Liberation Army said there might still be hope to find survivors. Wednesday’s big jump in the death toll — up from 410 on Tuesday — was due to rescuers arriving in places where they had previously been unable to contact anybody, in small farming villages built into the mountains above the main towns, said Feng, a military officer based in Sichuan province. Thousands of troops and hundreds of volunteers have rushed to Ludian to dig out possible survivors from the debris, but landslides and bouts of heavy rains have complicated rescue efforts. The quake struck an area of steep hills and narrow roads that are not well suited to all the traffic of the massive relief effort. Landslides have shorn shear rocky faces into the region’s valleys. The weather was clear Wednesday and the roads into Longtoushan were clogged with rescue vehicles, ambulances and military jeeps along with residents and volunteers on foot. The region is prone to earthquakes. In 1970, a magnitude-7.7 earthquake in Yunnan killed at least 15,000 people. In September 2012, a series of quakes killed 81 people. In May 2008, a powerful quake in Sichuan province left nearly 90,000 people dead.